February 6, 2019 - Andrea Amico and other PFAS community leaders meet with Deputy Assistant Secretary of Defense for Environment in the Office of the Assistant Secretary of Defense (Maureen Sullivan) at the Pentagon. May 31, 2018 - Andrea Amico & Alayna Davis of Testing for Pease speak on Portsmouth Community Radio WSCA to discuss Andrea's recent trip to the EPA Summit in DC, the ATSDR health study, and more. November 9, 2017 - Members from TFP meet with Portsmouth city officials to discuss PFAS levels in the city supplied drinking water and to discuss additional PFAS water sampling opportunities at Pease. July 6, 2017 - TFP co founder Andrea Amico is interviewed with NH State Rep Mindi Messmer on Portsmouth Community Radio. July 12, 2017 - Deadline for the CAP to submit written comments on the feasibility assessment to ATSDR. Please email us at info@testingforpease.com with your feedback to share with ATSDR. June 6, 2017 - Research paper published stating GAC filters may not be effective treatment for PFASs in drinking water. May 23, 2017 - ATSDR released the full version and a revised short version of the draft feasibility assessment for Pease. April 7, 2017 - Testing for Pease founder Andrea Amico writes a letter to the editor thanking NH elected officials for advocating on behalf of the Pease community. April 14, 2017 - NH State Representative Peter Somssich writes letter to ATSDR requesting feasibility assessment be released. April 20, 2017 - ATSDR releases a letter to the Pease CAP and a short version of the Pease feasibility assessment. January 1, 2017 - Testing for Pease sends a letter to Governor Maggie Hassan thanking her for her support and congratulating her on being elected as a U.S. Senator. January 9, 2017 - Testing for Pease sends a letter to Governor Christopher Sununu congratulating him on being elected Governor of New Hampshire and provides an introduction and background on the Pease water contamination. HB431. This bill would establish a commission to study long term goals and requirements for drinking water in the seacoast area. December 22, 2016 – Announcement in Seacoast Online that State Representative Mindi Messmer has filed water protection bills. Read Article. December 23, 2016 - Testing for Pease sends a letter to U.S. Senator Kelly Ayotte thanking her for her support. November 16, 2016 - US EPA issues new documents on "Supporting Documents for Drinking Water Health Advisories for PFOA and PFOS"
November 28, 2016 – Testing for Pease meets with Senator Martha Fuller Clark, newly elected State Representative Mindi Messmer, and CAP member and Portsmouth resident Lindsey Carmichael regarding legislation that State Representative Messmer plans to file. October 3, 2016 - Testing for Pease members present the PFC water contamination from a community perspective to UNH engineering students. September 7, 2016 - Pease water issues are featured in a Newsweek Article: Firefighting Chemicals Are Contaminating the Water of 16.5 million people. September 7, 2016 - TFP members and environmental epidemiologist Courtney Carignan write a letter to the RAB co-chair re: short chain PFCs at Pease. 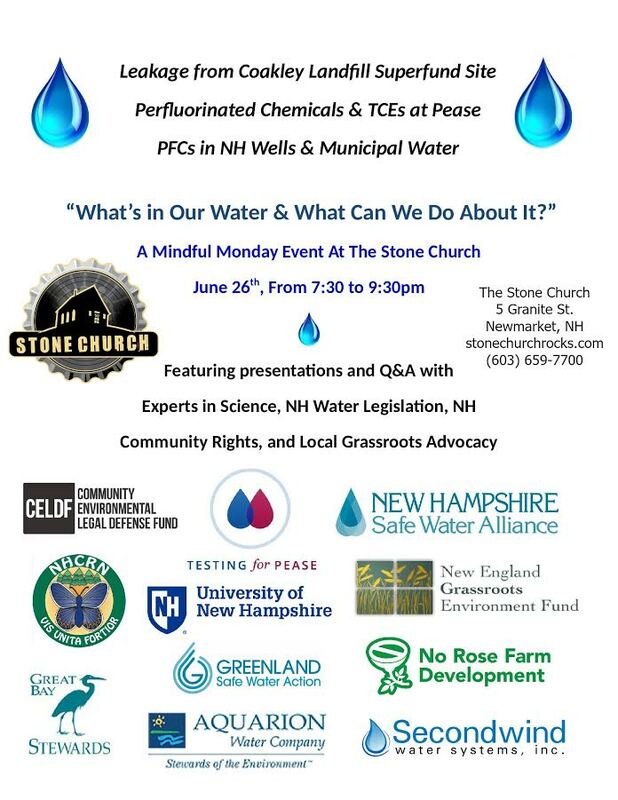 August 10, 2016 - NH DES hosts a public comment session on their rule making process for adopting the new federal guidelines for PFOS and PFOA at the NH DES office on Pease at 6:00 pm. NH DES notice. NH DES Slides. July 13, 2016 - NH DHHS re-opens PFC blood testing to the community. Register online. June 16, 2016 - NH DHHS Pease Blood Test Results meeting. Slideshow | Final Report. June 30, 2016 - Elevated PFCs detected at Coakley Landfill as high as 1,108 ppt. Read article. May 3, 2016 - First Pease CAP meeting with ATSDR. Meeting Minutes. May 5, 2016 - Testing for Pease meets with Governor Maggie Hassan in Concord, NH. Watch the WMUR news report. Read the Portsmouth Herald article. May 11, 2016 - Brown University releases a study that high levels of PFOA in women are associated with decreased breastfeeding duration. As exposure to chemical rises, so does risk of ending breastfeeding early. May 16, 2016 - Senator Kelly Ayotte sends another letter to the EPA urging them to expedite their release of a long term health advisory for PFOA| Letter (PDF). May 19, 2016 - EPA releases new drinking water standards for PFOS & PFOA to 70 parts per trillion. May 23, 2016 - Testing for Pease sends follow up letter to Governor Maggie Hassan. May 24, 2016 - Governor Maggie Hassan's response to Testing for Pease's letter sent on May 23, 2016. May 25, 2016 - Hassan pledges to expand Pease blood testing. Please call (603) 271-9461 or email peasetesting@dhhs.state.nh.us to sign up! April 8, 2016 - City of Portsmouth and Air Force strike a water treatment deal and filters for the Smith & Harrison well expected to be operational within 6 months. Read the press release and Portsmouth Herald Article. April 11, 2016 - NH DHHS weekly update reports that "all results for the Pease Testing Program have now been mailed back to participants". April 12, 2016 - Testing for Pease sends letter to government officials asking for more action in the state of NH to protect public health in the setting of PFC water contamination. April 12, 2016 - Senator Jeanne Shaheen speaks with the EPA re: setting a new standard for PFOA soon. April 13, 2016 - Testing for Pease launches a petition to the EPA and other government officials asking for non detect levels of PFCs as the new standard for drinking water. April 14, 2016 - Senator Jeanne Shaheen's staff responds to Testing for Pease's letter sent to government officials asking for more action in NH. April 19, 2016 - Senator Kelly Ayotte responds to Testing for Pease's letter sent to government officials asking for more action in NH. April 22, 2016 - Governor Maggie Hassan's response letter to Testing for Pease's letter sent to government officials on April 12, 2016. March 3, 2016 - Senator Ayotte questions Secretary of the Air Force on Haven Well clean up. March 3, 2016 - Senator Kelly Ayotte Questions Secretary of the Air Force on Haven Well clean up. March 4, 2016 - PFOA identified in Merrimack, NH. NH DES press release. March 12, 2016 - Brian Goetz, City of Portsmouth Deputy DPW Director, presents summary of Haven well at Portsmouth City Council retreat. March 16, 2016 - Air Force hosts their first RAB meeting on Pease. March 17, 2016 - ATSDR chooses CAP members. March 22, 2016 - Testing for Pease officially launches their website and community group. March 23, 2016 - The Sound in Portsmouth covers the launching of Testing for Pease website. The Air Force selects members for their RAB (Restoration Advisory Board) and the first RAB meeting open to the public is TBD. New Portsmouth Mayor Jack Blalock writes a letter to ATSDR recommending 5 former CAB members for the upcoming CAP with ATSDR. ATSDR presents to the Portsmouth City Council on February 16, 2016 and starts recruiting community members for the CAP. January 2016 - Air Force selects members for the RAB. First RAB meeting is TBD. February 16, 2016 - ATSDR presents to Portsmouth City Council on upcoming CAP. CAB had their final meeting on December 1, 2015 as their work under the current city mayor and leadership came to an end. The CAB made recommendations that a CAP (community assistance panel) with ATSDR form in the near future to continue the work of the CAB to focus on long term health effects. The CAB chairman presented a summary of the CAB’s work and recommendations to the outgoing mayor and city council at the end of December. The state presented the results of the pediatric blood test results from the first round of testing to the community on September 9, 2015. The CAB met with the federal agency ATSDR (Agency for Toxic Substances & Disease Registry) to discuss possible ongoing health studies on the Pease community. October 2016 - Second round of blood testing provided by NH DHHS closes. 1107 community members give blood samples in the second round of testing. The EPA ordered the Air Force to treat the Haven well on Pease for PFCs and to design a contingency treatment plan for the Smith and Harrison wells on Pease. CAB meeting occurred on July 15, 2015 with an Environmental Pediatrician from Boston’s Children Hospital to discuss what is known about PFC contamination and children. There were ongoing discussions and advocacy for the state to open a second round of testing given the heightened community interest in getting their blood tested. The CAB met with the US Air Force on August 26, 2015 to discuss the treatment and clean up of the contaminated wells on Pease Tradeport. August 2015 - NH DHHS opens second round of blood testing to the Pease community for anyone that missed the deadline for the first round of testing. The state released their blood testing protocol on their website and the Governor of NH, Maggie Hassan, expanded the blood testing protocol to include ALL community members exposed to contaminated Pease well water prior to May 2014 (when the Haven well was shut down). Portsmouth Mayor, Robert Lister, formed a Community Advisory Board (CAB) to better enhance the relationship and communication between the state and community. The CAB had their first meeting on May 6, 2015. Multiple CAB meetings occurred in June. The first round of blood testing ended on June 12, 2015. The state presented the first round of 98 adults blood test results to the community on June 17, 2015 and the results of the Pease community are elevated when compared to national averages. April 2, 2015 - State releases blood testing protocol and agrees to test anyone exposed to contaminated water on Pease prior to May 2014. Protocol was revised in June 2015 (PDF). April 2015 - community members start giving blood samples in the first round of blood testing. April 6, 2015 - NH DHHS starts posting weekly updates on their website for the community. April 23, 2015 - Portsmouth Mayor Robert Lister forms the Community Advisory Board (CAB) to assist with communication between the community and the state and represent the diverse voice of the community. June 12, 2015 - first round of blood testing ends. June 17, 2015 - NH DHHS Dr Benjamin Chan presents to the community the first 98 adult blood test results in first round of testing. DHHS Summary (PDF) | DHHS Presentation (PDF) . A representative from NH DHHS presented to the Portsmouth city council on March 16, 2015 and stated the blood testing protocol has been approved and the state plans to test 100 community members starting in April. The city council and community was not pleased with this limited number. The state hosted a community meeting at the end of March with excellent community attendance. The community expressed their frustrations with the lack of communication and community involvement in the planning process. March 16, 2015 - Rick Cricenti from NH DHHS presents to the Portsmouth City Council giving update on status of testing and informs city council state plans to test 100 community members. March 17, 2015 - Air Force tests water at Pease daycare from tap with and without Brita filter. Results reported on April 16, 2015 reveal Brita faucet filter makes low level PFCs non detect! March 18, 2015 - Senator Jeanne Shaheen asks the U.S. Air Force to assist with the costs of testing for Pease at a meeting in Washington. Frustrated with a lack of response on the city, state, and federal level, Andrea Amico called the Portsmouth Herald to see if they will run a story about the lack of action and follow through by the state on the blood testing protocol. The Portsmouth Herald returned her call and wrote a front page newspaper story about her frustrations. The newspaper article gained the attention of the community and city & state officials finally started to take action. Andrea Amico started an online petition to advocate for a blood testing protocol and a Testing for Pease Facebook page to keep the community up to date on the status of blood testing. January 12, 2015 - Andrea Amico speaks with reporter Jeff McMenemy at the Portsmouth Herald regarding her frustrations and lack of response from the state re: blood testing for her family. January 15, 2015 - Article runs on Portsmouth Herald front page detailing Andrea Amico’s frustration. January 20, 2015 - Andrea Amico starts the Testing for Pease facebook page to keep the community informed on the happenings at Pease surrounding the well contamination. January 20, 2015 - Andrea Amico initiates an online petition to the Air Force, State of NH, and City of Portsmouth - Provide testing for the people of Pease exposed to contaminated well water. The petition was signed by 270 people. January 23, 2015 - City of Portsmouth Mayor Robert Lister sends a letter to Governor Hassan expressing dissatisfaction with the time it has taken for DHHS to develop a plan and asks for a detailed timeline on the status of blood testing to be given to the city. January 23, 2015 - US Senator Jeanne Shaheen writes a letter to the CDC advocating that the NH DHHS blood testing protocol be reviewed expeditiously. Andrea Amico continued to attempt communication with the state to check in for updates on the status of blood testing for her family. The state stopped returning her emails and phone calls in October 2014. The Air Force agrees to pay the city of Portsmouth $154,000 to look for a new well/water source. Andrea Amico continued to communicate with NH DHHS via email and phone about blood testing for her family. The state responded that they are working on developing criteria for the blood testing process. Andrea Amico reached out via email to several government officials (city, state, and federal) asking for assistance in urging the state to push the blood testing process along. The Pease wells are tested for the first time for different kinds of PFCs in the water (some that are labeled a contaminant of emerging concern) in April 2014. The results came back positive in all three wells on Pease (Haven, Smith, & Harrison), but the Haven well was shut down immediately due to PFC (PFOS) level greater than the Environmental Protection Agency’s (EPA) PHA (provisional health advisory). There was a newspaper article in May 2014 to inform the community of the contamination and a community meeting at the end of May 2014 to answer community questions and concerns. At the community meeting, the NH DHHS (Department of Health and Human Services) did not recommend blood testing for the community. Community member, Andrea Amico, met an employee of NH DHHS at the end of the community meeting and asked for blood testing for her family. She started contacting the state/NH DHHS via email to pursue blood testing at the end of May. May 28, 2014 - Portsmouth resident, Andrea Amico, attends the community meeting and questions state officials about how to get blood testing for her family (husband and children on Pease daily and exposed to contaminated water) in place. She starts emailing NH DHHS official at end of May to pursue blood testing.